I am one of those people that love chicken livers, and this is my favourite way of eating them. This salad is amazing, the raspberry vinegar I fell in love with after making this the first time. I like it for lunch or dinner with some crusty bread. I love the speck in the salad, actually there is nothing I don't like in this salad. Be careful not to over cook the eggs, as when the yolks are still runny it adds extra flavour to the leaves, so don't get distracted, keep them soft boiled. 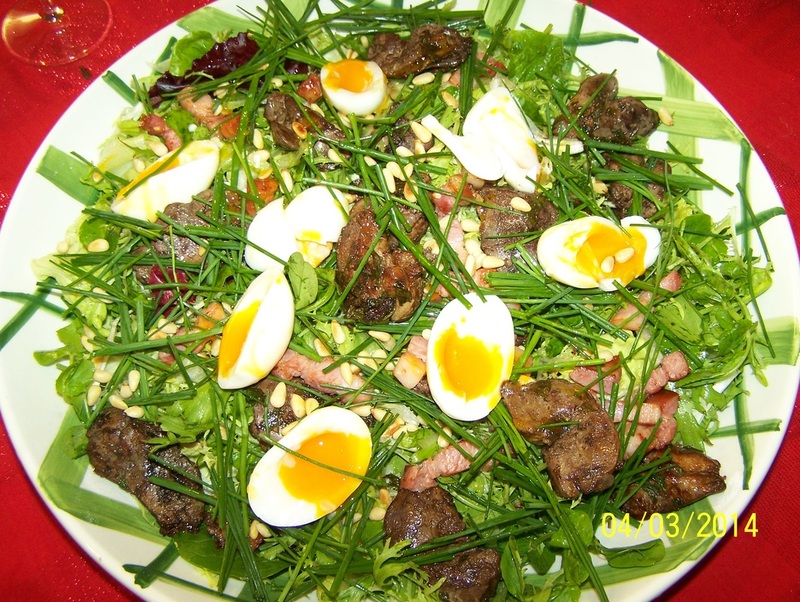 If you can't find frisee, just use mixed salad leaves. Raspberry Vinaigrette: Place the extra raspberry vinegar, vegetable and olive oils, salt and pepper in a glass screw top jar. Seal and shake until well combined. To toast the pine nuts, I put them in a clean frying pan and stir around until they start to colour, set aside until needed. Place the eggs in a small saucepan, top with cold water. Bring to the boil over medium heat, simmer for 2 minutes for soft boiled, drain and refresh in cold water. Carefully peel the eggs, set aside. Heat the oil in a large frying pan over high heat. Add the speck and fry for 5 minutes or until golden. Remove and set aside. Do not spill out the fat left in the frying pan. Season the livers with salt and pepper. Add the livers to the speck oil in the hot frying pan. Cook for 1-2 minutes on each side, or until golden but still pink in the centre. Add the vinegar and stir, scraping the base of the frying pan to release any stuck down bits. Now stir in the parsley and remove from heat. Place the frisee in a large serving bowl. Add the raspberry vinaigrette and toss gently to combine. Top with the speck and the liver mixture. 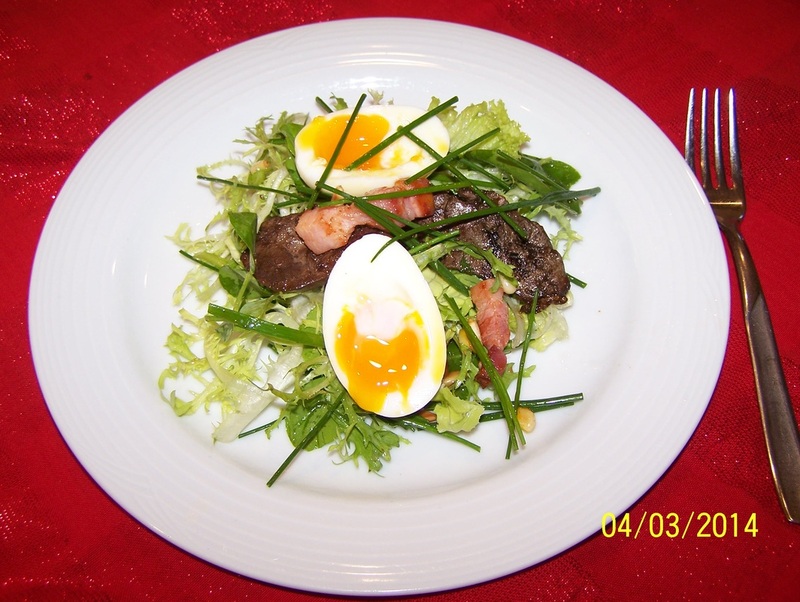 Slice the eggs in half over the salad, then place them around the salad. Sprinkle with the toasted pine nuts and chives. Serve immediately.